BlackwaterBLUE from monkster.com: Wesley Sneijder in the mix? Wesley Sneijder in the mix? 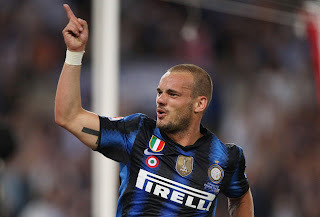 Speculation of a transfer to Stamford Bridge in the past, Wesley Sneijder is playmaker figure that has, at one time or another, been called the best player in the world. He has lit up two major international tournaments for Holland, and he has an impressive club record for Real Madrid and Inter Milan. Reports in Italy suggest that an offer from Chelsea, upwards of £30million, could be tabled for Sneijder in a 'matter of days'. He was arguably the key man for Inter during their successful Champions League campaign, and the Dutchman has shown signs of discontent ever since Mourinho left. There is no doubt that Chelsea would have to fork out the cash with Manchester United also said to be in the mix for Sneijder's signature. However if Marco Van Basten or Guus Hiddink find themselves in the top job at Chelsea next season, it could influence Sneijder's decision favorably for Chelsea fans.